To extend the life of the rubber snow deflector, the first and most important step is conducting a proper install. The featured video below provides a step by step instructional guide on how to properly mount a snow deflector to your BOSS Snowplow. Tip #1 The snow deflector kit will include an installation manual. The manual covers various blade types. 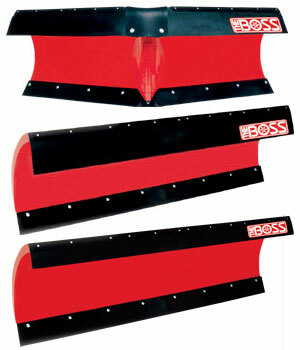 Before beginning the install, highlight the dimensions in the manual that match the size and style of plow. This will help avoid accidentally using the wrong blade dimensions during installation. Tip #2 Remove the roll of belting in the kit and allow it to lay flat overnight before installing. This will make it easier to work with when installing the deflector on the snowplow. Tip #3 The kit comes with four metal straps. Two of them will need to be modified to the dimensions listed in the manual. When doing this, make sure to round off the sharp corners and edges to prevent the belting from tearing during use. Tip #4 IMPORTANT! DO NOT align the front edge of the center belting to the the bottom of the side belting. Instead make sure that the center belting has a distinct curl. Having a nice curl in the center belting will help to prevent tearing. Tip #5 Before securing the fasteners on the center belting, raise the plow and put it into scoop mode. Make sure the center belting does not get stuck down between the blades, or tear out of the top plate. Watching the video below and remembering the tips above will help accomplish a proper install of THE BOSS Rubber Snow Deflector and extend the life of the product.